This year, the Legacy Traditional Skills project, spearheaded by Offaly Local Development company, set about the ambitious task of reviving some of these skills by running a series of traditional skills workshops at various locations throughout the county. These workshops were delivered by masters in their craft. You may have noticed the posters as you travelled the county, or have seen the posts online. Hopefully you got to take part in one of the workshops. 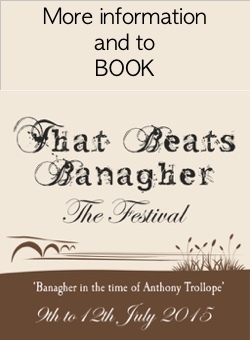 The climax of this project will be a celebration of tradition and heritage taking the form of the Traditional Skills Festival in Banagher, Co. Offaly in August (22nd to 24th). 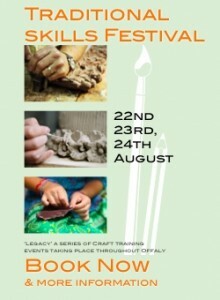 Over the three days, the town will play host to a series of workshops, demonstrations and other interesting events. Make sure to bring along your children too as there will be something for all the family. The workshops will include such skills as Pottery, Dry Stone Wall Building, Willow Weaving, Batik, and Felting. Many of the workshops will have both adult, and child suitable sessions. There will be something for all the family. The full list of workshops and events is available on the website Here. If you don’t want to miss out on learning that skill you’ve always wanted, make sure to log on to the website and book the workshop(s) you’re interested in. Also keep an eye on the website for any news related to the Traditional Skills festival. This entry was posted in Uncategorized on July 28, 2014 by Aileen Duffy.